You are lost in space and there is not enough fuel left to return to the Earth. 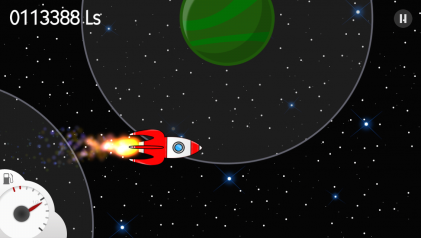 Try to avoid the planets and collect ‘PowerUps’ to reach your home planet – your destiny awaits you in the stars! Each time you begin the game you will fly through a completely different universe. 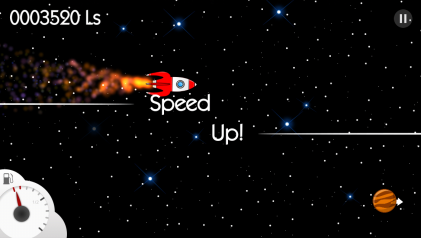 Playing ‘Lil‘ Rocket’ is never repetitive…not even when trying for the hundredth time to reach your home planet. 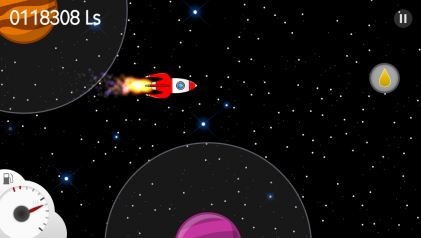 Activate ‘Game Center’ on your iPhone and travel to infinity and beyond – or simply travel to the edge of the Universe! Check out Lil‘ Rocket in action! Watch the video to get a first impression of Lil‘ Rocket. Steer the rocket by tilting your mobile device. What counts is both skill and strategic thinking! The Universe is inhabited by a lot of wonderful planets, so…you should watch out to avoid them!